Senator Patty Ritchie, right, is pictured with Jack Proud and Suzy Beyer. 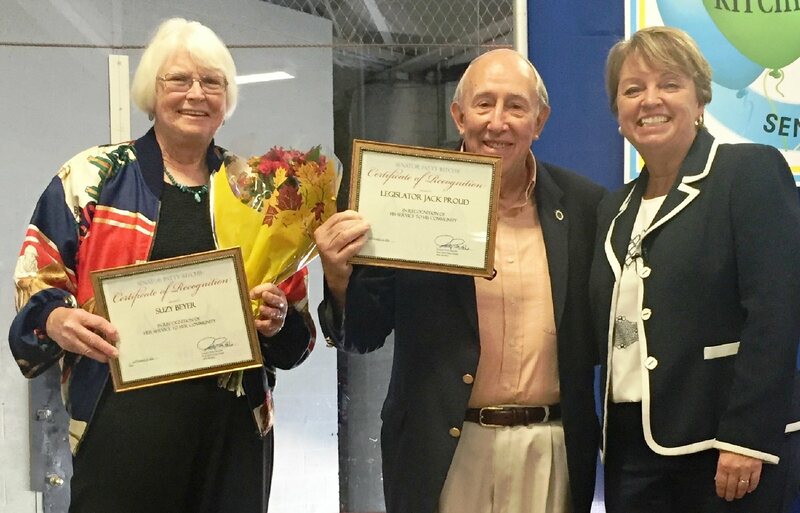 FULTON, NY – State Senator Patty Ritchie honored two local seniors for their contributions to their communities recently at her annual Oswego County Senior Health and Wellness Fair. Those honored included Oswego County Legislator Jack Proud and Suzy Beyer, a longtime volunteer with RSVP of Oswego County. Held Sept. 21, Senator Ritchie’s Oswego County Senior Health and Wellness Fair attracted more than 500 people and helped to connect members of the region’s aging population with health checks and tips to improve their well-being. Senator Ritchie will host two more Senior Health and Wellness Fairs in the coming weeks. On September 29, her St. Lawrence County event will take place in Ogdensburg and on October 19 her Jefferson County fair will take place in Watertown.